Three lovely words that, when brought together, make something so delicious it brings tears to my eyes!! This is so easy to put together & I promise you that you won't just make it once-your loved ones will make sure of that! Keep costs down & use basics or value cream cheese, it works just fine & you don't need pricey biscuits either it will still taste great! Place 200g of the biscuits into a food processor & whizz until you have fairly fine crumbs (or place into a bag a bash with a rolling pin). With the mixer running pour the melted butter into the crumbs, the texture will feel like soggy sand! Tip the crumb mixture into a loose bottomed cake tin & press down with a spoon or your fingers making sure it comes up the side of the tin a little. Place in the fridge for about 2 hours until firm. Put the other 50g of biscuits into a plastic sandwich bag & bash with a rolling pin, ideally you want big & small chunks for texture! Beat the cream cheese & icing sugar together until smooth then whip the cream to soft peaks. 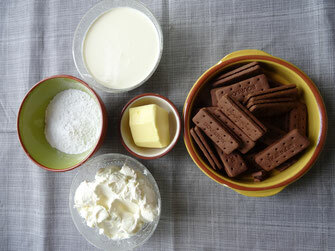 Fold the cream into the cheese then the biscuit chunks. Remove the biscuit base from the fridge & top with the cheese mixture. Spread it out evenly. Place the cheesecake back in the fridge for about an hour or until ready to serve then remove from the tin & transfer to a plate. Try & keep an extra slice for yourself because you made it!